China focus: Landmark two sessions set course for "new era"
BEIJING, March 20 (Xinhua) -- As the curtains closed on the annual two sessions Tuesday, China is setting sail in the "new era" with a detailed chart, steered by a remarkable helmsman and a competent team. The first sessions of the 13th National People's Congress and the 13th National Committee of the Chinese People's Political Consultative Conference are the first high-profile national political events held since the 19th Communist Party of China (CPC) National Congress last October, a landmark Party congress that revealed the roadmap for China's rejuvenation. 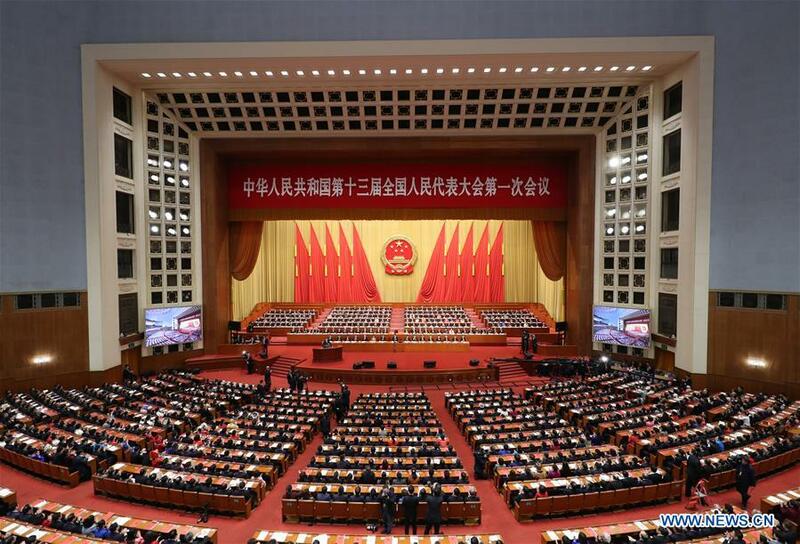 "It will be another Long March to materialize the blueprint," said newly-elected President Xi Jinping at the closing meeting of the annual legislative session, calling for greater efforts to make outstanding achievement in the new era. The historic two sessions expedite the country's march to its rejuvenation. China not only conventionally unveiled specific targets and priorities for this year's development, but also set a new state leadership and government to realize its ambitions. Under the leadership of the CPC Central Committee with comrade Xi Jinping, who was re-elected president unanimously, at the core, such pledges will be fulfilled to benefit China and the world. The economic target is GDP growth of around 6.5 percent for 2018, unchanged statistically from last year but different in essence. Gone are the days when double-digit growth was the norm. China has made it clear that it intends to pursue high-quality development powered by greener and more sustainable engines such as consumption and services. The projected GDP expansion rate will still be one of the fastest worldwide, lending new steam to the recovering global economy. China rolled out a sweeping cabinet restructuring plan to cut bureaucracy and improve governance efficiency, introduced a nationwide supervisory commission network to toughen the fight on corruption, and most importantly, amended its fundamental law to enshrine "Xi Jinping Thought on Socialism with Chinese Characteristics for a New Era" as the guiding principle for the country's rise. These reforms will help China to achieve "socialist modernization" basically by 2035, and become a "great modern socialist country" by the middle of the century, a key goal in the Chinese Dream. The world should rest assured that China's ambitions are not hegemonic. "The Chinese people's sincere wish and practical action to contribute to the peace and development of humanity should not be misinterpreted, nor should they be distorted," Xi said. China has no plans to dominate the world. Its rise might "alarm" certain countries, but it will be good news for the world at large. The country's success story offers other countries and regions new philosophies of growth and governance. The year 2018 marks the 200th anniversary of Karl Marx's birth as well as the 170th anniversary of the publication of the Communist Manifesto. This Western-originated philosophy has taken root in China and been adapted constantly to meet China's changing needs. Whatever coinages are thrown at China's political and growth model, the effectiveness and efficiency of Socialism with Chinese characteristics cannot be denied. It has helped hundreds of millions of Chinese people grow rich and the country become strong. "History has proven and will continue to prove that only socialism can save China and only by adhering to and developing socialism with Chinese characteristics will we realize the great rejuvenation of the Chinese nation," Xi said. The world, especially the West, should be open-minded about China's formula for growth. Cold War-era thinking is outdated and could only hinder the world's irresistible course into a new era. Being stuck with a zero-sum mentality risks plowing the globe into a "Thucydides Trap," a scenario without winners. For the world, China's development is mutually beneficial in nature. The country's burgeoning middle-income population, at around 400 million now, offer a growing consumer market for overseas firms. Increasingly affluent Chinese are ready to pay for high-quality products, services and unique experiences, fuelling imports and globe-trotting trips. China has decided to completely open up its general manufacturing sector to overseas investors this year, while market access to sectors like telecommunications, medical services, education, elderly care and new energy vehicles will also be expanded. The development of China-proposed Belt and Road Initiative will see more roads and railways built to accelerate cross-border exchanges on more fronts, consolidating a new platform for fresh sources of global economic growth and shared prosperity for other countries. Even bolder steps are expected to be taken to open China's market wider this year as the country marks the 40th anniversary of the reform and opening-up drive, a "game-changing" move, as the government work report termed it, in making China what it is today. China's rejuvenation might also be a game-changer when it comes to shaping a Western-dominated international community into a more balanced, stable and prosperous world. The misleading "China threat" argument is losing ground in the new era. China must seize the day; the world must seize China's opportunities.